Boxwood shrubs are one of the most popular options in landscaping--and for good reason! These stately-looking evergreens add a feeling of decorum and stability to any area of the yard. They are perfect choices for hedges or to add dignity and year-round color to the front of almost any house. Boxwood does not require much maintenance, but they can’t be totally ignored, either. Here are a few tips to help keep them thriving and a few things to watch out for that could indicate signs of trouble. You usually don’t need to water your boxwood once it’s established. Water it frequently in the early-growing period and during dry conditions, but boxwood does not like standing water or wet soil. So, make sure your soil drains well or your plants could suffer root rot, which could turn parts of the shrub light brown and even cause it to die. A few inches of mulch (chopped leaves or wood chips) will help to maintain cool soil conditions for your boxwood. The mulch also helps retain soil moisture and gives protection to the plant's shallow roots. When you prune your boxwood shrubs, you'll be encouraging healthy growth and keeping them attractive. Just be sure to remove any trimmings that have fallen to the center of the plant. If left to accumulate there, they might precipitate disease that could spread to the rest of the shrub. If you want to encourage healthy growth in your boxwood, use a slow-release granular fertilizer in the spring. Your plants are also less likely to be attacked by diseases if they are fed regularly. Your scent-marking pets will cause will cause brown and yellow leaves on your boxwood. They can even kill a whole branch. Dog and cat repellents, sold at most garden centers, will keep them away. Winter winds can be harsh on your boxwood shrubs. It's best to put up a burlap screen around them, as long as you allow enough space for air to circulate around your plants. This will even protect them from the winter sun, which can cause scalding and hurt their appearance. When dead leaves and stems accumulate in the center of the plant, a fungal disease can soon follow. 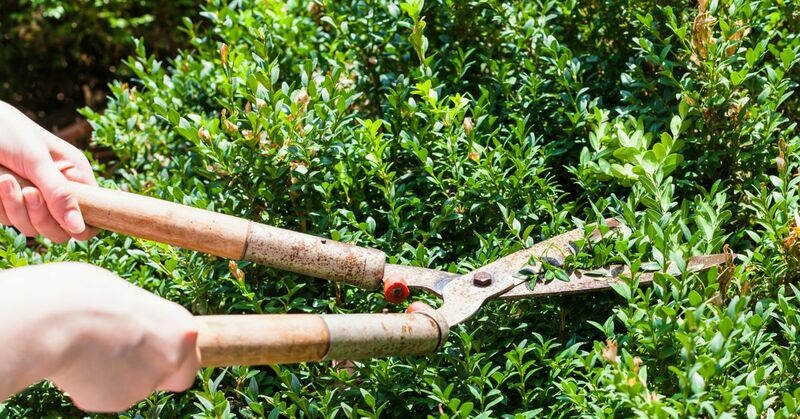 Be sure to remove all debris after pruning, but if you still find dying branches, cut them out and thin the outer growth so air and light can reach the center of the plant. Pruning is an important aspect of maintaining rose bushes. These steps make that process easier. Want to turn that black thumb a little greener? Start with any of these five easy-to-grow houseplants.